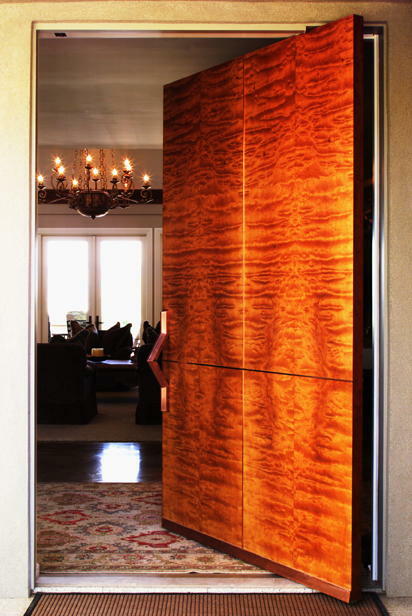 Wood River Veneer fabricates doors for residential, commercial and institutional settings. We fabricate doors of various types for a wide range of applications such as; Entry, interior passage, cabinets, storage lockers, safe rooms, wall partitions, barn and pivot. We specialize in the fabrication of over sized doors with light weight cores as large as 16 feet tall, 12 feet wide and 6 inches thick. For the most part the doors we construct range from 3/4" to 2-1/4" thick. Our door core options are; solid particle, plywood, high density pulp fiber honey comb, aluminum honey comb and fiber glass honey comb. We also fabricate custom garage doors for over head, track or hinge/pivot installations. Its not uncommon for us to be asked to supply shops with custom laminated door style, rail and panel components that they will then assemble in their own shop setting. So give us a call or send an email and let us provide you with a free estimate. This is a 44"x96"x2" pivot mounted, highly figured African Makore front door that is inlayed with copper, which actually sits proud of the door surface by approximately 1/8 inch. The door faces are identical on both sides and it has a natural finish. We book and balance the veneer; then end match all eight pieces at the point where the door handle will center to create the look we are after. I think the layout worked out really well! We also decided to call the figure Pommelle Drape, because it's a combination of the two and it sounds good. This door graces the entry of a beautiful home in Boise, Idaho. We build these custom doors in collaboration with an artist specifically to be carved. In order to do this we use varying thickness's of Basswood for the door skins, LVL and a high density honey comb core for strength, stability and weight control. The idea is to construct a door that will remain stable whether it is relieved on one or both sides. The artist that carved the door is Jack Burgess. If you are interested in a carved door you can contact us or Jack directly at www.jackburgess.com. Jack creates beautiful carvings and sculptures with wood and bronze and we build doors for many different applications. Together, we can turn your idea into reality. 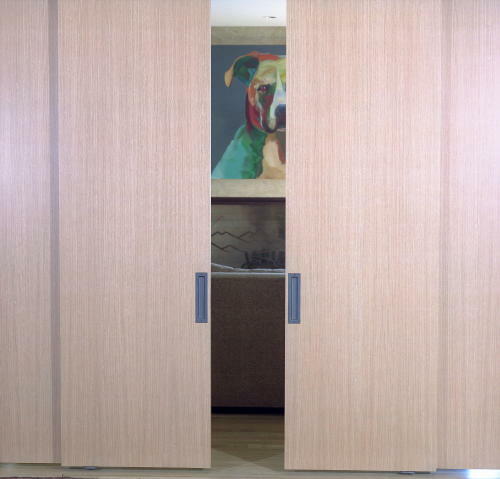 This quadruple set of sliding doors is just part of an entire home full of white oak doors we built. They are large and had to be sequenced and center balanced on both sides. We constructed the doors with a high density light weight core, cross banded them to prevent telegraphing from the hardwood edges and faced them on both sides with Rift White Oak. One other thing that these doors have is what we call an invisable edge. What that intails is hiding the door skin edges with the finished solid door edge. This only works if you cross band both sides of the door trapping a T-moulded dimensional lumber edge with perpendicular grain. This application really looks good but it does take more time to do and that does add up to additional expense. The good thing is that our customers get to decide whether that look is important to them or not. Sometimes we are asked to fabricate component parts for doors that other shops are building. This is one of those cases. We made the Crotch Mahogany panel for this door but another shop assembled the actual door. This may sound easy but it actually isn't. 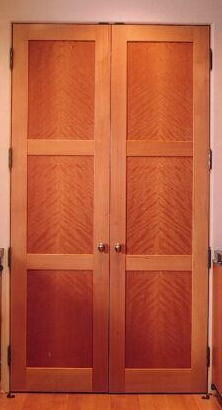 The challange was to come up with wider than available Crotch Mahogany to create an attractive good two side door panel. What we were able to do was to take four large African Crotch Mahogany leaves, clip them through the heart and re-splice them together to create two very large faces. The only way we can do this is to soften the crotch and flatten it. Once the veneer is throughly flattened we dry it to a point where we feel comfortable enough to work with it. Whenever you try to splice crotch heart together you have to be very careful. It can't be too wet or too dry, it needs to be moist enough to stay flat but not too moist to hold tape. Perhaps you can tell from the photo, it worked! Wood River Veneer fabricated pretty much all the component parts for around 100 of these doors. The style and rails are flat cut Bubinga. The panels are combinations of quarter cut Santos Rosewood and Pommelle Bubinga. The doors actually have seperate panels on either side that may match or display a different pattern. Seperating the panels helped keep the doors balanced. We made 3 plys for the style and rails and balance matched panels for the field components. These are very complex doors and very expensive but really attractive. 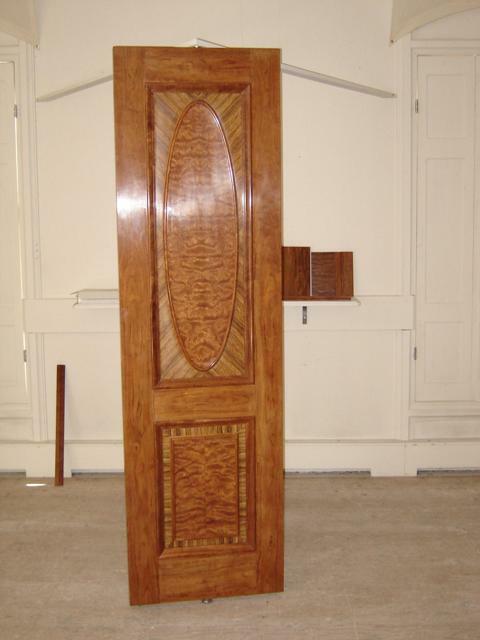 We also supplied the Bubinga base, case and door frame components. Wood River Veneer designed and installed these panel doors made with European Steamed Beech and South American Amarello as well as the adjacent cabinetry, Beech flooring, bookcases, sofa and game tables. We specialize in the construction of unusual and large custom interior, exterior doors as well as garage doors. Wood River Veneer built these custom designed white Oak panel doors for a private residence. The panel doors were constructed with rift white Oak style and rails and quarter cut flake recessed flat panels. All the panels were book matched and center balanced. We were able to procure a large white oak flitch that enabled us to use a portion of it that had a medium wish bone flake for the passage doors and the heavy tiger flake portion for the cabinet doors, which were book matched and center balanced as well. The rift white Oak that we used for the style and rails was a seperate sequence that we acquired specifically for its rift cut structure. These Rift white Oak and Ice Birch passage doors are flush with a black inlay. The doors are identical on both sides and are consistant through out the house. We used a high density light weight core and cross banded over the finished rift Oak edge. The owner of the home we built these for designed the doors and I think she came up with a great design. They weren't the easiest doors to build but looked great when they were done. Unfortunately we have yet to get pictures of them with a finish, but we will! 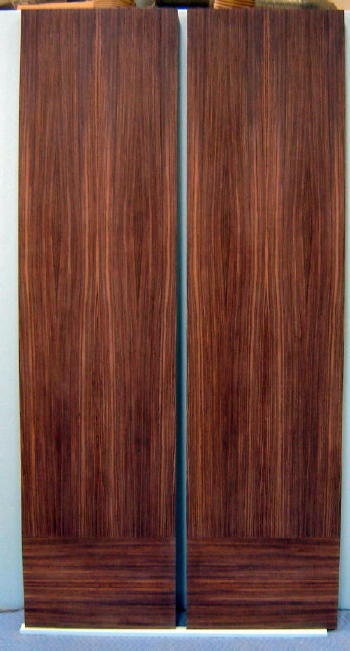 These are two of an entire house full of quarter cut East Indian Rosewood custom made doors that we built a couple years ago. The doors are a variety of width's, 8'tall and 2" thick. They all had a bottom rail and the style edges are quarter cut Wenge. We did incorporated a light weight core and invisable edge to avoid seeing the door skins. All the faces are book matched, center balanced and sequenced. The door frames are quarter cut Wenge. The doors were finished with a clear coat lacquer. True East Indian Rosewood starts out dark and eventually will lighten up quite a bit. These doors are unfinished and you can see how dark they are. Wood River Veneer builds some very large doors and this is one of them. We are asked to build large doors for a variety of uses. 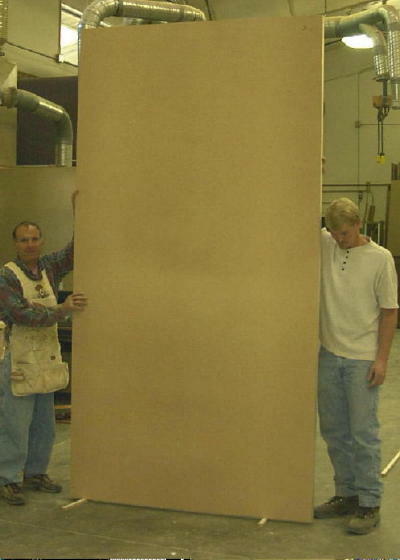 An example of a large entry door that we built would be; 7'6" wide x 8' Tall x 4-1/2" thick. A lot of the large interior doors we build range from 3'-6" to 6' wide x 8' to 14' tall x 2-1/4" thick and may operate as pivot, hinged or room dividing pocket doors. When we build oversized doors we incorporate light weight core construction. By the use of non conventional core construction we can typically reduce the weight of an oversized solid core door by 30% to 50% and keep it flat. 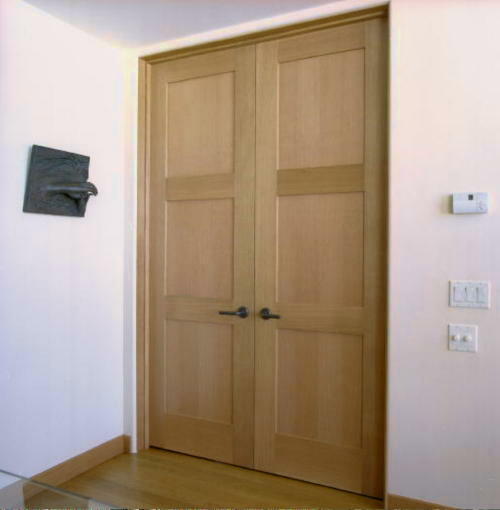 If you have the need for over sized doors, give us a call!